All kids are amazing! But not all kids know how to be good. If, like most parents, your goal is to raise kids who are responsible, kind, intelligent, and yes, even fun, then this concise-yet-thorough guide is for you! Tapping into her psychology background, along with twenty-five years of experience working with kids in all stages of development (including her own four), Tara offers tips to help y… ou: Define what it means to be good in your home and learn to lovingly take charge, encouraging your kids to respect you and your authority. Find ways to discourage and retrain annoying and even dangerous behaviors (like throwing toys and tantrums, running away from you, etc.) Prioritize taking care of you, giving you more energy (and sanity) for the sometimes exhausting parenting journey Develop your own core beliefs as a parent, helping you establish and achieve your goals for your family Taras honesty, approachability, and candor will engage you while offering insights that may keep you sane for the next eighteen-ish or so years. Put on an educational show for the kids (ha! 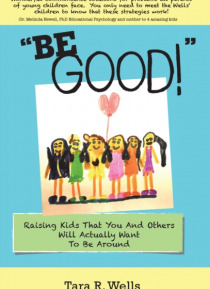 ), pour your fifth cup of coffee for the day (she knows its only nine a.m.), and gain some wisdom on how to teach your kids to be good (some advice works for spouses as well).